Don’t miss out on a limited number of adrenaline activity vouchers for Christmas, which come with a FREE 2nd gift voucher for laser tag at Lazer Planet based at ScotKart in Clydebank, just West of Glasgow City Centre. 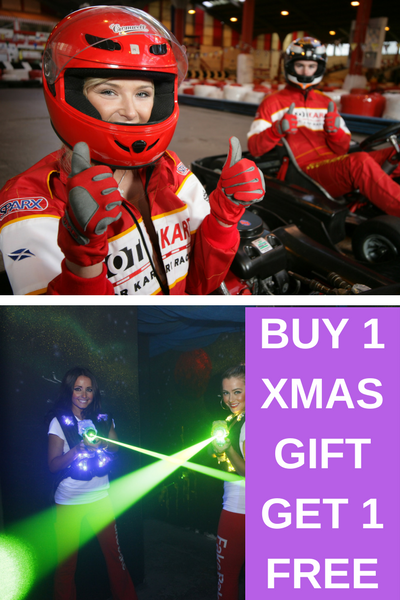 ScotKart adrenaline activity gift vouchers are the easiest way to buy adult or kids karting (age 8+), laser tag and refreshments for someone special this year. Give the gift of racing this Christmas, a thrilling day of hi-speed fun, or an epic sci-fi laser tag adventure at Lazer Planet and receive a 2nd voucher for award winning laser tag at Lazer Planet in Glasgow. sessions, if it’s a first time driver. Don’t delay, as numbers are strictly limited for this fantastic offer, guaranteed to put a smile of 2 peoples faces this Xmas. Book online now, by clicking the links above, or call 0141 641 0222 if you have any questions.